Recently there was a Gujarati food festival at Marriott which I had to miss due to work. 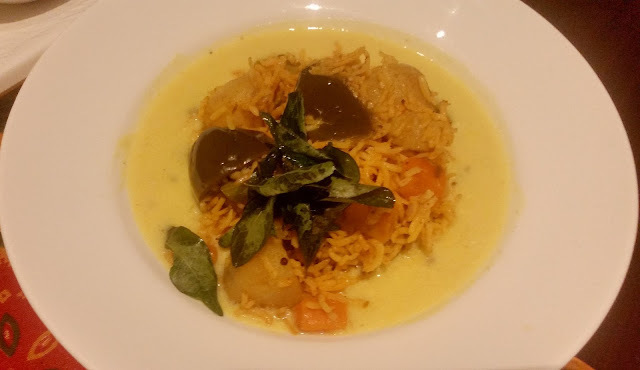 When I was told later that there were some excellent preparations by a home chef, I was feeling a bit upset at missing out on some good Gujarati food. 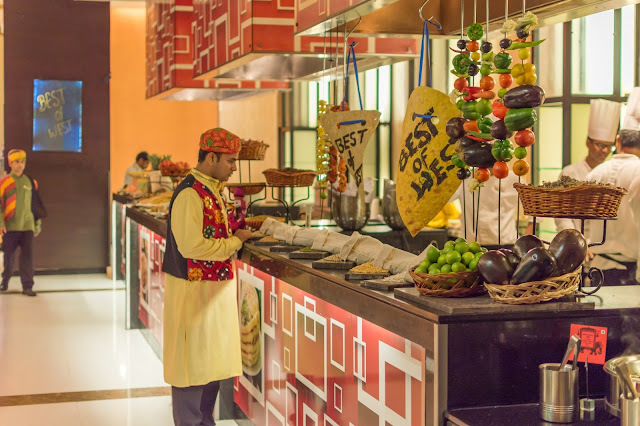 But little did I know that soon The Square, the all-day dining restaurant at Novotel, Hyderabad airport will be hosting “Best of The West”, a festival celebrating cuisines of Gujarat, Maharashtra and Rajasthan, serving some good dishes from that region. Each of the three states have their distinctively different cuisines. 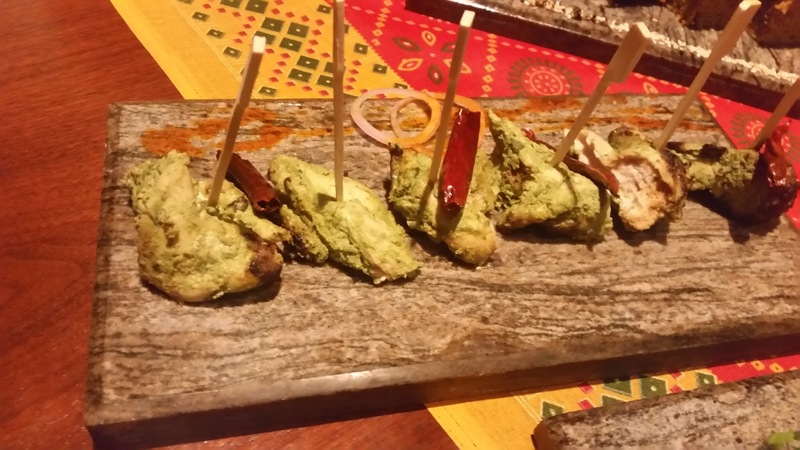 Gujarat boasts of a predominantly vegetarian fare with a sweetish bias in many of their dishes. 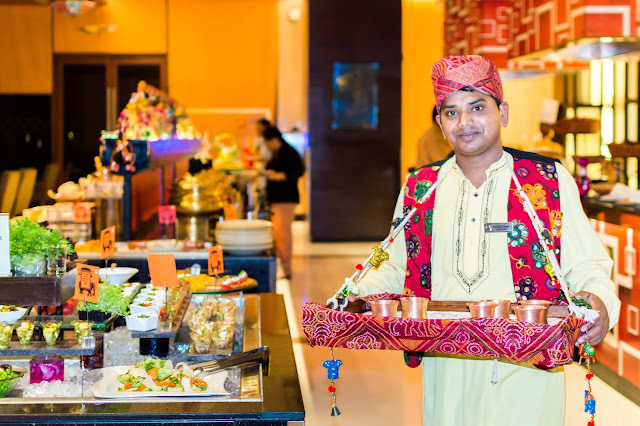 Rajasthani food ranges from snacks like Pyaaz Ke Kachori to the lovely desserts like Ghewar, not to forget the famed Lal Maans and other non-vegetarian delicacies. Maharashtra has distinct sub-regional tastes from Kolhapuri, Malwani and Vidarbha. 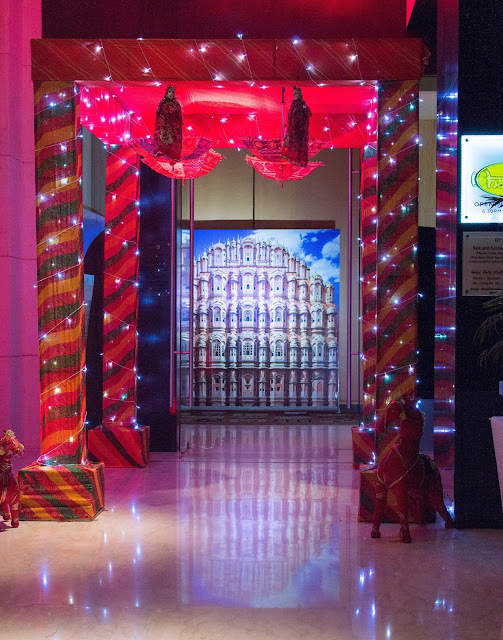 The Square has been decked up for the festival in an ethnic way, starting from a colorful entrance set up for the festival, a selfie station with a pic of Hawa Mahal in the background, Rajasthani puppets and the waiters turning up in Gujarati attire. 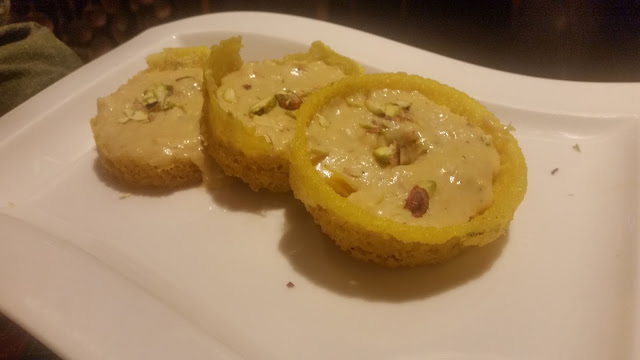 Whereas the Rajasthani and Maharashtrian food were prepared by in-house chefs, a Gujarati home chef Mrs. Jahnvi Naik, helped them with the Gujarati dishes. The festival is part of the usual buffet, which means the Indian section of it has been replaced by offerings from Western India. The oriental and continental sections remain as it is. Invited for a bloggers preview, we were welcomed with some really good Thandai with nice flavour of zafraan and enriched with nuts. The starters were served on the table. Fish Koliwada is a signature dish from Maharashtra. 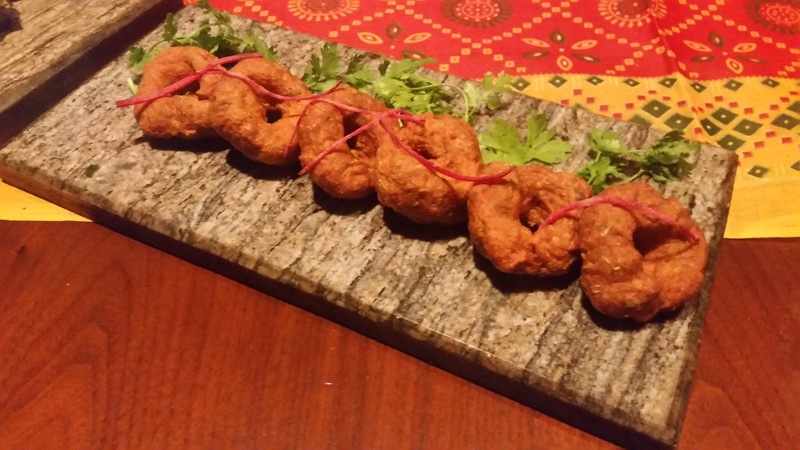 The dish was presented nicely with round boneless pieces of fish garnished with coriander leaves. The fried batter on the fish was nice though I would have liked a little bit more of spices in it. Another Maharashtrian dish of note was Aloo Til Tinka or potato croquettes coated with roasted sesame seeds. Gujarati Handvo, a spicy rice and dal baked snack was something which also attracted my attention. I cannot vouch for authenticity, but the dish surely had a different taste which I liked. There was also some Hariyali Murgh Tikka in the menu which surprised me a bit, I could not recall if any of the three states showcased were known for their kababs. There were two live counters serving Pav Bhaji and Thepla. I tried the Pav Bhaji – the bhaji was exceptionally good tasting just like those served in Chowpatty. 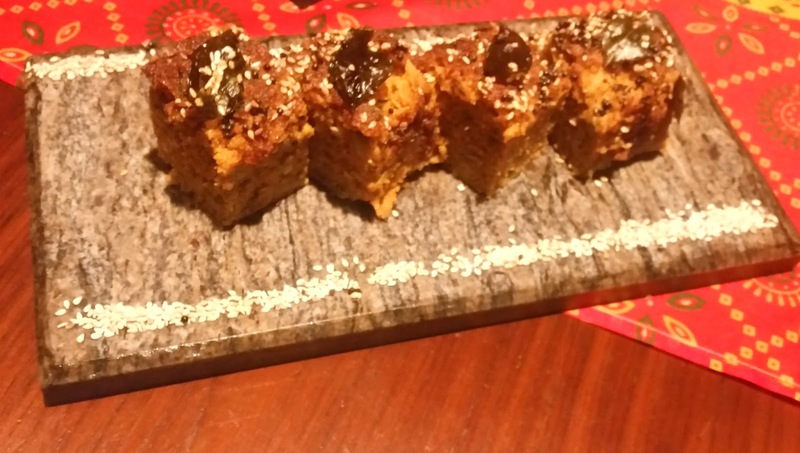 For the main courses, we started with the Gujarati delicacies. I liked the Dal Dhokli, where small pieces of wheat dhoklis are cooked in lentils. The dish went very well with rotis. I also enjoyed the simplicity of the well-known combination of Kadi with Khichdi. Undhiyu the slow cooked Gujarati preparation of mixed vegetables was decent. 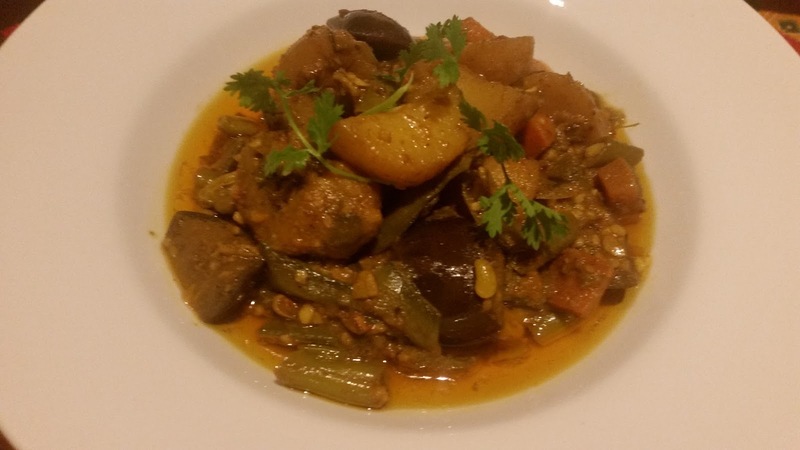 The vegetables were well prepared in oil and spices giving the dish a rustic taste. From Rajasthan, there was Gatte Ki Sabji, which is especially popular in the dessert areas where not much vegetables are grown. Dumplings made out of gram flour is cooked in a dahi based gravy. 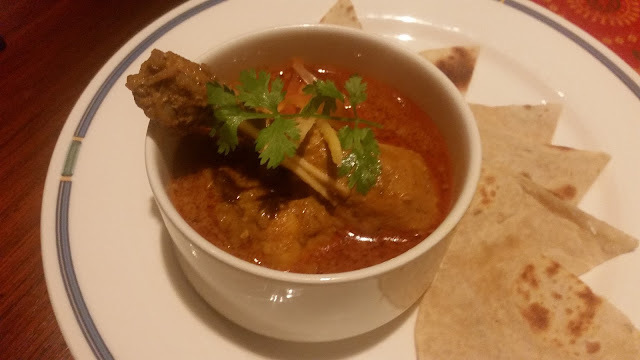 The dish was paired with some Bajra Roti. 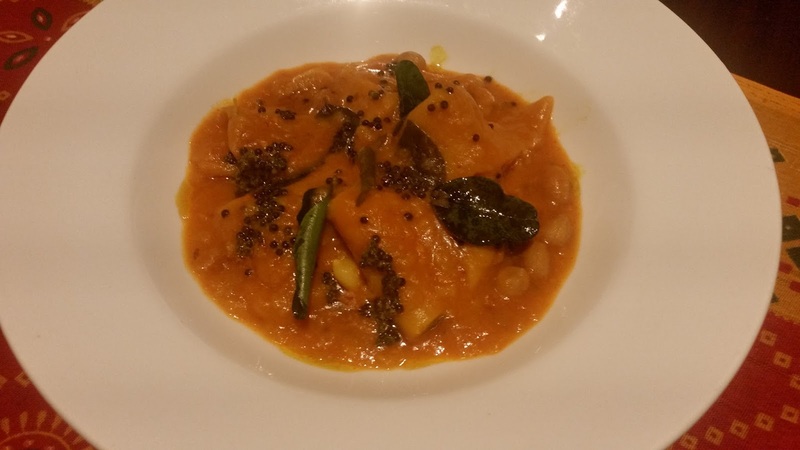 There was also Subz Jaipuri, a mixed vegetable curry in a tomato based gravy. The Bharli Vangi or stuffed eggplants from Maharashtra looked and tasted similar to our own Hyderabadi Bagara Baigan. Paneer Kohlapuri, a paneer dish from the region was as spicy as any Hyderabadi dish. Gujarat is not much known for its non-vegetarian cuisine. The only dish showcased for the day was Memoni Biryani, a dish popular among Memons from the Kutch area. The biryani had much lesser masala compared to the Hyderabadi counterpart, the rice was flavourful and the mutton was especially good. The Saoji Chicken Curry was like any other chicken curry, a resident of Nagpur commented that it needed to be super spicy and dark colored. The Ratnagiri Fish Curry flavoured with kokum had a nice balance of spices and a tangy taste. I missed my favorite Lal Maans from Rajasthan. In fact I thought that some Rajasthani non-veg should have found a place. I was told that the festival has a menu which changes every day, so these will be accommodated on another day. 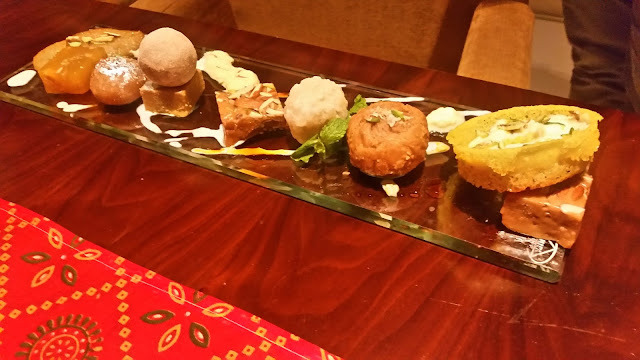 The dessert counter was extremely attractive with Ghevar, Malpua, Murmura Ka Laddu and Puran Poli. I liked the Malpua and the Ghevar, in spite of their high sweet quotient. There were also a range of Gujarati and Rajasthani namkeens on offer like Bhakarwadi, Namkeen Karela and Samosas. The Best of The West Food Festival is on till 11th September as part of the evening buffet at The Square, Novotel Hyderabad Airport. It is quite a comprehensive buffet with lots of dishes to make it worthwhile to visit all the way to Shamshabad. The buffet is priced at Rs 1440 plus taxes. 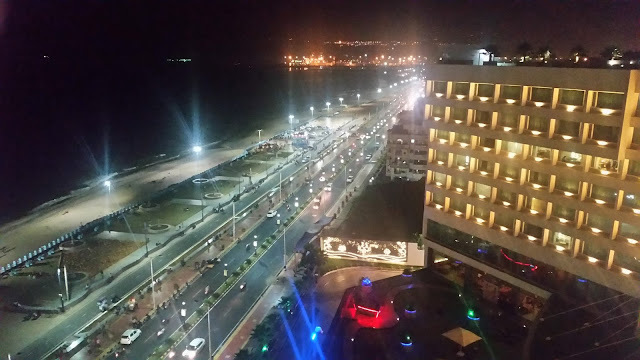 Note: Some pics are courtesy The Novotel.